Today’s cars are loaded with electronics. You’ll find dozens of electronic control modules in a base model and even more in a luxury one. Electronics power the touch screens on the console for seamless communication between the car and the world outside. Surround view cameras and radar sensors cooperate with the braking systems to keep us safe on the roads. Some cars can even park themselves. Hundreds of millions of lines of code are required to make these cars run. It’s so much code, in fact, that it surpasses the amount found in a passenger airplane. And this is just the beginning. Increasing connectivity, autonomy and electrification means more code and more demands on the processors. It’s common for cars to contain features that use a dedicated processor and unique software. For example, the electronics and software typically used to control braking systems are very different from those used to control powertrain systems. However, the low amount of re-use of both hardware and software is a problem for automakers. It means slower, costlier development and a later delivery date to dealer showrooms. Coding efficiencies diminish since each component is designed disparately from other systems in the car. Often the software is incompatible with other connection points inside the vehicle, requiring even more code to facilitate the exchange of information. Look at dynamic stability control, for example. It requires instantaneous communication between the braking and powertrain systems to ensure the right balance of braking and power is applied to the vehicle. Because each of the systems run unique software, an extra layer of software might be required to get the two to connect and “talk” to one another. To run the code reliably, high performance computing is required. Inside advanced driver assistance (ADAS) and self-driving systems, for example, the processor needs to crunch enormous amounts of data generated by sensors such as radar, lidar and vision systems. Using this data, the processor can determine the location of obstacles, predict their motion, plan the trajectory the vehicle must take, and even control the vehicle along that path. The processor continuously updates the optimal path in real time to account for the ever-changing behavior of real road users. The processor needs to connect and communicate to the steering, braking, clusters, and sensors around the car – securely and safely without fail. Further fueling the pressure for automakers is the opportunity to enhance the in-vehicle experience and deliver cars that meet emerging new business models. Similar to a smartphone, cars should offer connected, upgradable, and personalized experiences. And, like the smartphone, it should have the ability to add new features and subscribe to new services. 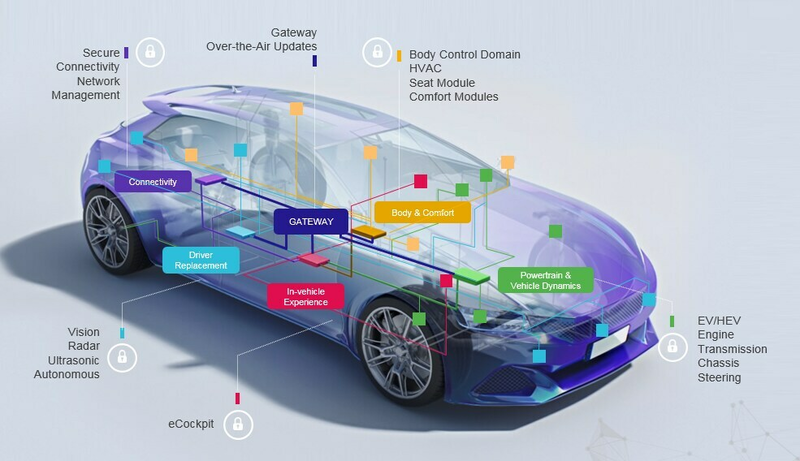 All of this adds to up to incredibly opportunity – and extreme complexity – for automakers who are forced to master systems integration of hardware, software, security and safety. And they’re under tremendous pressure to speed up the roll out of the latest features to consumers. A standardized way of working across vehicle application domains – and even market segments and geographic regions — is needed to meet increasing performance demands and control over skyrocketing development costs. At NXP, we realized we had to reinvent the hardware to support the software of future vehicles. Our recently announced S32 Automotive Processing Platform was built on a scalable, common hardware architecture that uses a common hardware security engine. The S32 offers 10 times the performance of today’s top safety performing platform. It also provides an identical software development environment across all of our automotive processors. This means that carmakers can use the same base code across hundreds of applications, from seat reclining to autonomous driving. With up to 90% of code re-use, carmakers save valuable hours of development time so they can roll out new cars to market faster. Even more industry-changing is that carmakers have the ability to deliver new products and features long after the car rolls out of the dealer lot and into the hands of consumers with S32 secure over-the-air (OTA) updates. Automakers can offer option packages that change throughout the life of the car to match consumer preferences, and even introduce new features and new systems. The S32 OTA provides zero downtime plus full roll-back features on applications that are running on S32 processors. Today’s new cars include many safety, personalized and connected features. 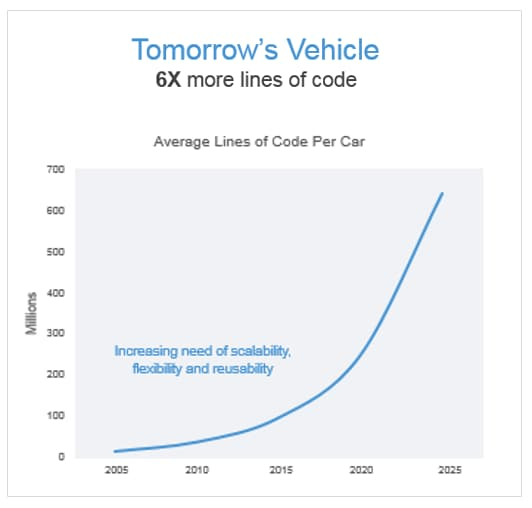 Software will only continue to grow in importance as we move closer to autonomous driving. That’s why a common platform of hardware and software is critical to meet the growing complexity that we’re seeing today.